LED light bulbs have been available for household applications for several years now, but they were always high priced and not as pleasant to the eye as we would have hoped. With time, these bulbs have been perfected and the cost has come down with mass production. 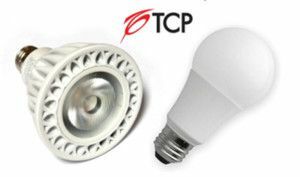 We are now excited to offer top quality LED solutions from TCP Company, based in Aurora, OH. Some of the main benefits of LED light bulbs are as follows: Cost efficient, Energy Efficient, Durable, Long Lasting, Cool-Burning, Pleasant White Light, Dimmable, Safe and Easy to Dispose. Energy/Cost Efficient: LED bulbs use less energy than compact fluorescent bulbs to create the same amount of light (or Lumens). For example, a 60 W equivalent compact fluorescent bulb will use approximately 13 W of electricity, whereas the same output in a LED bulb would be 11 W. This drops the estimated energy cost per 60 W equivalent LED bulb (if used for 3 hrs/day) to a miniscule $1.32 per bulb! Easily pays for itself over the 20 year life expectancy of the bulb. Pleasant White Light: As I hinted on before, LED lights are now being made in soft/warm tones for use inside your home. No longer are they blue in color and harsh on the eye. The soft white light from our TCP lamps have a very warm appearance with bulbs ranging around 2700K, which is equivalent to the warmth of traditional incandescent bulbs! Durable/Long Lasting: LED light bulbs have no comparison when it comes to longevity. Your typical incandescent bulb has a rated life of about 1000 hrs, and your typical compact fluorescent bulb has a rated life of about 12,000 hrs. With LED bulbs, you are looking at an average life expectancy of 25,000 hrs (or about 22 years if used for 3 hrs/day). This will more than justify the upfront cost of the LED bulbs! LED bulbs do not have a filament and are not made with fragile glass components, so they are very durable and can withstand impacts and vibration very well. Cool-Burning: LED light bulbs are cooler to the touch in comparison to compact fluorescent, halogen, and incandescent bulbs. This makes them great solutions for lamps that have tight fitting lamp shades or other applications where the heat from the bulb can be bothersome or potentially dangerous. Dimmable: Our TCP brand LED bulbs are slowly dimmable, which makes them work with any and all of your favorite light fix your favorite light fixtures. They also turn on instantly, so unlike most of your compact fluorescent bulbs, LED bulbs will reach their full brightness when moments of turning them on! Safe and Easy to Dispose: LED bulbs do not have mercury in them and can be disposed in your everyday trash. No worries here. We invite you to try some LED bulbs throughout your home. You will be impressed with their form and function and the energy savings will be noticeable, making these bulbs great for lamps and lights that are used frequently and for long periods of time! For more information on our LED choices, please feel free to call our store and speak to our Housewares Department.